Hanjian Construction was founded in October 1978, and after more than 30 years of trial and hard work, it has now developed into a large enterprise group with talent socialization, industrial diversification, scientific management and technological modernization. Beijing Hanjian Group won the first batch premium qualification of general construction contractor of housing building engineering in July 2002, and won new premium qualification again in 2011.It has premium qualification for general construction contractor of housing building engineering, Grade A qualification for design in the construction industry, Grade I qualification for general construction contractor of hydraulic and hydropower engineering, Grade I qualification for general construction contractor of municipal public works and Grade I qualification for general construction contractor of restoration and protection projects of cultural relics.At the same time, it has qualification certificate of contract foreign projects approved by National Ministry of Commerce. Its business scope covers housing, municipal administration, road, bridge, hydraulic and hydropower and other areas, and now has extended to other professional areas such as explosion and demolition, intellectualized architecture, structural reinforcement and sports field and facility. Engineering under construction is seen everywhere in Beijing, and has developed to surrounding cities constantly. 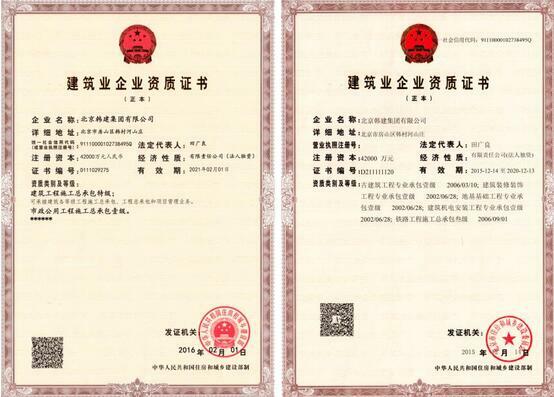 Hanjian Construction has established a full set of quality assurance system and passed the supervision audit of ISO9001:2008 Quality System Standard and ISO14001: 2004 Environment Management System Standard and certification audit of B/T28001—2011 Occupational Health Management System, developing intoa “three standards embraced in one system” company. High quality projects built by Hanjian Construction are seen everywhere in Beijing.The company has built a large number of landmark buildings with high scientific and technological content, such as the International Liaison Department office, Higher People’s Court of Beijing, business premises of the labor market of Beijing, Zhongguancun CEC building, China National Film Museum, Shijingshan Basketball Gymnasium Reconstruction Project. Hanjian Construction haswon Luban Prize, Zhan Tianyou, National Excellent Project, National Model, Gold Award and Silver Award of Municipal Excellent Project, Structure Great Wall Cup and Completion Great Wall Cup, and has more than 480 municipal high-quality projects, more than 390 city-level and district-level safe and civilized construction sites, and more than 80 national and municipal outstanding QC management achievement awards over the years. Hanjian Construction has won the first batch of National Construction Grade-AAA Credit Enterprise, National Construction Credit Enterprise,National Excellent Construction Enterprise, National Excellent Enterprise of Project Construction Quality Management, National Excellent QC Achievement Award of Project Construction and National Advanced Collective of Construction Safety and other titles. Hanjian Construction has been honoring credibility, guaranteeing quality and paying attention to science with good trustworthiness and reputation, and is looking forward to your cooperation sincerely!